Does this make sense? 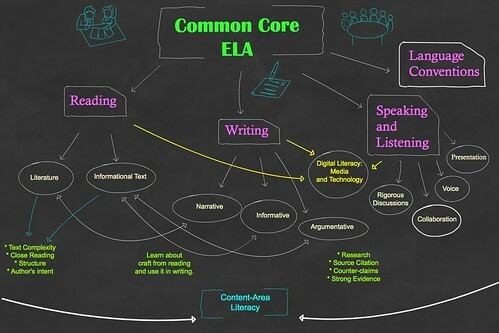 I am developing a diagram for a workshop I am giving about the ELA Common Core document. I was trying to simplify the threads and show some connections. What am I missing? Or what is confusing? Help me, if you can, with comments. This entry was posted in Common Core. Bookmark the permalink. Great visual–I’d love to use your final version with my PLC if I may. What jumps out at me is the Media and Technology bubble. I picture digital literacy integrated in all areas, so I would place it much as you did the content area literacy. Thanks so much for sharing–and for inviting input from such a broad audience! Good point, Sue. I struggled with that, and with keeping the map as simple as possible. But I might revise that part of it. Is it your intent to emphasize the ‘hiearchy’ of the Common Core? Your image definitely makes it look top-down. Is it? Is the close reading of a poem the same as the close reading of an informational text? Knowing a little bit about your classroom teaching philosophy mightn’t it be worthwhile to have an alternative map that is more networked and reflective of ‘permeable edges’ between reading, writing, and ‘listening/speaking’? I guess that might muddy the waters, but be aware of the dangers of simplifying too much, but maybe the three writing purposes and their circles could intersect? Is there any piece of writing that is so ‘pure’ as to have only one of these purposes? That probably isn’t very helpful. Overall, it does simplify the CC and that is handy. I would like to see people talk about their workflow as they incorp. CC into daily work or maybe you could describe how you are working inside of this chart. Do you? I love that “permeable edges” idea. Yes, my classroom would look different but this map is for the start of conversations around CC in a PD session, so I was going simple. And that meant there was a hierarchy to it (which may not exist as much as I represent it here). Thanks for the feedback. You have Reading Literature connected with Writing Narrative and Reading Informational connected with Writing Informational; however, Writing Argumentative is lost and alone. Should this not be connected as well? I don’t think Argumentative Writing is disconnected from reading in any way. Besides, Citing Strong Evidence is connected all throughout the strands and not mentioned. It’s imperative that students learn to prove their points in all areas with evidence. I also agree that Digital Literacy should be mentioned. It’s huge. In Speaking and Listening, shouldn’t Presentation Skills and Collaboration be mentioned? Finally, there’s no Language component. I feel that’s important since it’s a strand of the ELA CC. I really like the map. I would love to use it when you are done. I am part of our county CC team and this would help a lot of my teachers. I will keep revising it …. Not to muddy the waters but, since speaking and listen has to come through in all parts of the CCSS, could you put it in the middle and then put rdg, wrtg and lang under that? More like “chicken foot”? Just thinking…what do you think? I’m wondering now if I need to redo the whole chart from scratch and move to some different kind of visual charting system. Darn it! I think you should keep your visual…it’s a reminder of just how inter-connected the CCSS really is! Amy is correct that you do need to keep your visual. It’s a great example of collaboration! Trying another format is also a part of the revision process! What grade levels does your PLC encompass? I wonder if all standards are equal. What do you think? In reading, standard 1 “evidence” and standard 10 range and text complexity are huge and both have implications for reading, writing, speaking, listening, and even language across multiple content areas! I think of the ELA standards K-12 as more of a lego – stacked model so that I can see the layers that overlap and interlock similarly to a jigsaw puzzle. I don’t have a visual yet – I tried using wordle to “tease out” the most frequent words in each set of standards and I haven’t gotten back to see the results yet! I like that Lego image. I am going to keep what I have for now, but also, keep thinking about it in other directions. The group I am leading is a collection of educators (teachers, curriculum coordinators) across the grades. It might be a courageous thing to try, but what about getting them to come up with a map/metaphor together then compare to yours and then synthesize a better map? I think it would be worth the time to ask them where they ‘see’ or ‘feel’ the CC and how their work flows from it. Or perhaps their work flows to it and they are simply playing how do I plug in the CC to satisfy my principal? Maybe starting with them is the place to get to a suitably useful map. Their map.